The Solar Eclipse of 20 March 2015 generated considerable interest amongst observers in UK. Every decade or so we get to see a significant Eclipse from UK (the next will be 2026, for a maximum of 95%) and every century or so we manage to see 'totality' of a Total Eclipse (the last was 11 Aug 1999, the next not be until 23 September 2090 !). The maps below (source: NASA) show the path of totality for both Total (blue path) and Annular Eclipses (red path) in 5 sets of 20 years, from 2001-2100. Those viewing from either side of the totality path (up to a distance up to 2-3 times the Totality path width) will see a partial eclipse. Here we have collected the outline details of future Solar Eclipses to help you plan your holidays. Links are given allowing you to check viewing locations and, perhaps more important, the exact local times and viewing details. La Serena. Starts 4:24pm - Totality 5:39-5.42pm - Ends 6:47pm (the sun will still be 1 degree above the horizon when the eclipse ends). Times for La Serena (CLT � Chile Standard Time). San Juan. Starts 4:27pm - Totality 5:41-5.42pm - sunset 6.41pm (Eclipse ends 6:47pm). Times for San Juan. At totality the sun is 10 degrees above the horizon. Jun�n, Buenos Aires. 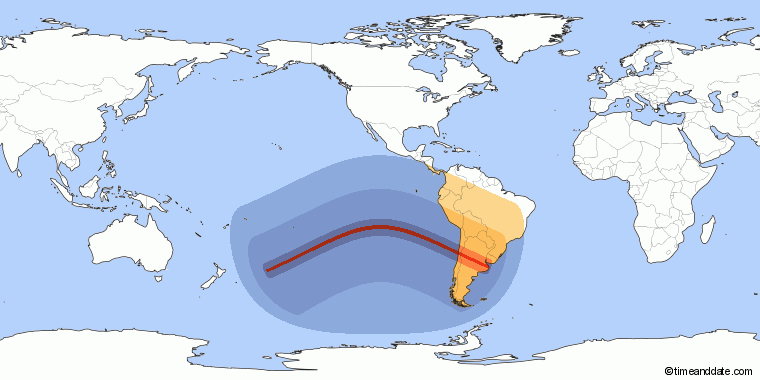 Starts 4:35pm - Totality 5:43-5.45pm - sunset 6.03pm (Eclipse ends 6:46pm) all times = Buenos Aires local. At Totality the sun is only 3 degreess above the horizon == to see the full eclipse you must have a free view to the West-North-West horizon (N 300 degrees). This note last modified: 24th Mar 2015 18:56. This page last modified: 4th Jul 2015 20:49. Page Clicks to date: 475. User 18.234.236.14 @ ec2-18-234-236-14.compute-1.amazonaws.com.